Each time a new visitor comes to Venice, we always like to tell them that Grease was filmed at Venice High when we drive by that school. That film was beloved by so many of us (so was Grease 2, maybe even more so ...), so when I read that Venice (aka Rydell!) High was hosting a sing-along screening of the movie on the football field where it was shot last Saturday, we were in. It was a full carnival atmosphere, with students selling raffle tickets, and the Alumni Association folks were manning the multiple concession stands (with a bbq grill right there on the field! ), selling everything from homemade taco specialties to burgers, cotton candy, and popcorn for the viewing. There were pie-eating contests, and that kind of thing, making us kind of nostalgic for all the stuff you got into during school. There was even Gunther the Gondolier was strolling around taking pictures with all the little kids. Little kids who had never seen Grease before! So that was fun, singing all the goofy Grease songs at the top of our lungs, as the kids looked at us like we were nuts. People were all in a great mood, and no one seemed to mind when our kid posse got distracted and ran in circles and threw balls all over. As kids do. There were Pink Ladies and T-Bird greasers in the house, and I even spotted a few poodle skirts in the mix. The sun went down, the big screen lit up and we all broke into song together as the gigantic almost-Supermoon rose up above us. Grease is classic. I saw it so many times back in the day, but I'll echo an Alumni woman I met in the bathroom who said, "This is the best time ever!" as it quickly became my favorite time I've seen it. If you haven't yet been to this landmark film location, be sure to get there for the fun next year. Thank you to Venice High for hosting such a fun event, and for the reminder that Grease is indeed the word. When the sun rose yesterday morning, you just knew it was going to be a great day for the 31st Abbot Kinney Festival. It was HOT, it was bright, and everyone was all the way ready for it. I live right around the corner from Abbot Kinney, so you could feel the anticipation (and hear the tent poles clanking) all night long leading up to the big day. Booths lined the boulevard from Venice Boulevard to Main Street, where you could purchase or learn about pretty much everything under the sun. I have a friend who saves her jewelry budget all year to get new things at the Festival, and this year probably gave her a huge haul, as there were so many great artisans selling their original pieces. You could buy art, soap, clothes, chimes, hot sauce, or even get a massage ... the only problem is having enough time to see and do everything - which I never do. The Abbot Kinney Festival is great because it ends up being a big reunion of your favorite Venice locals, many of whom now totally avoid Abbot Kinney these days, due to its influx of chain stores and scenesters. We again had an advantage this year to meeting up with our locals by having the "Locals" stage located at Andalusia. With the School Of Rock kids kicking it off, then Kim Michaelowski, then our Venice Symphony Orchestra, it definitely was the place to find your favorite people. In fact, the line-up was so good that it actually made it hard to leave and see any of the rest of the Festival! A good problem to have. We had the pleasure of watching our dear Lacey Cowden make a whole slew of new fans, while accomplishing the major feat of getting a festival crowd to be stone silent while they listened to Cowden weave her musical spells. It was awesome. The Spirit Of Venice Awards were appropriately given out at the Locals stage, and I was so happy to see my friend, Edizen Stowell of Venice Paparazzi, receive her richly deserved honor. WIth a break in the music, it was time for a quick lap to see what and who else we could see. The kids area down at Westminster was very popular for families, though the Ferris wheel looked a little rickety for my taste. Also on Westminster was an area for the chalk artists, a Gary Palmer spearheaded project that hopes to become its own fun festival soon. Kids were taking part in a big colorful chalk mandala, exactly the kind of participation and color you want to see during your neighborhood festival. After a quick spin through the Roosterfish, and stopping every few feet to greet a new old friend, we made it back to Andalusia to see Matt Ellis and his band blaze through their set. Ellis organized the Locals stage, so it was beautifully curated with all our talented friends playing. His own set was a true highlight of the day, as our gang all congregated and danced around. Ellis and his wife/bandmate Vavine arrived in Venice ten years ago exactly, and the Festival was their welcome to town, so it was extra special to have them playing at it. With all the hoopla of the day, I have to envy a kid who can sleep this soundly through it all. Beckett wins! I bet he had awesome dreams. The great National Anthem played next, a fun and purely rocking set. My friend Quinn's reaction was not a good review of the band, it just got loud. I kept running into long, lost faces, and to me, that is the very best part of the Abbot Kinney Festival. We always call it "Venice Thanksgiving", and this year was no different. People will avoid AKB all year, but they'll come back for the Festival. And they'll have a blast. It's great to live right around the corner now, so we can have a headquarters. A place to take a break, use the bathroom, get out of the sun, take a nap, make road drinks ... I did none of that myself, but it was nice to know I could. There was too much to do to hang out at home! Our friends and neighbors Nocona headlined the Locals stage, and have quickly become one of our favorite bands after complete throw down shows at block parties earlier this year. We love them. I also love that their kids and their kids' friends all play instruments, and are gearing up to take on the Locals stage for years to come. This year it was enough for them to watch their parents rock. The sun began to set on the 2015 Festival, but things only got more heated up. Crowds flocked to all the watering holes and beer gardens up and down the street, DJs took over for bands, and everyone either kept dancing, or stumbled off to watch the lunar eclipse go down (I did the former and totally forgot about the eclipse until it was too late - oh, well.). The annual sweep down the street by the lights and sirens came along to clear out the people, and with it, the clanking of the tent poles dismantling for another year. It was a completely beautiful day in every way, made most so by all the beautiful, wonderful people that came out to celebrate our home. I don't think of the Abbot Kinney Festival as a celebration of the boulevard, but as a celebration of the man, Abbot Kinney. As an all day opportunity to toast the cool dude who created the playground where we now dwell, and thank him for it. On days like yesterday, you forget about any differences among us and our individual ideas and ideals for Venice, and just get down with your people. Gratefully. 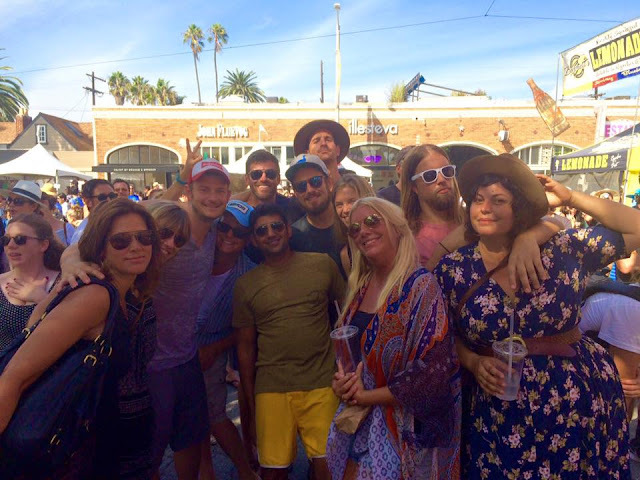 Cheers to another year of the Abbot Kinney Festival, and to all of us - for being there, and for being Venice. I always get a boost from seeing the Skate And Destroy car in Venice. Why not make your wheels fun too? It's the last full day of Summer, and what a seriously beautiful Summer 2015 it was! Sunsets like maybe never before ... music filling the starry nights ... warm waters to swim in ... stories told around backyard fires ... wearing way less clothing ... this Summer was fully great. I was walking along thinking about all that when I saw this new piece by Wrdsmth up in Venice, and it made me feel like the whole Summer did. Shiny. As if on cue, the overcast skies of Autumn have just now descended upon us here, but who cares, because the sun shines IN us, as this wonderful bit of street art reminds. You shine! No need to blush (but it's pretty cute). September's Venice Art Crawl was one for the history books. SUPER fun, all evening long. This was the second "Afterburn" edition, with Venetians returning from Burning Man bringing some of that Playa to the middle of closed-down Rose Avenue. The street was closed between Third and Fourth Streets, with art installations and colorful crowds of Burners and just folks out walking their dog that stumbled upon this eye and mind blowing art extravaganza. It was a pure celebration of FREEDOM, in art, in dress, and in the collective minds of everyone there. Everything was all lit up, and music was thumping from the giant rave scene anchored by a giant Trojan Unicorn, filled with dancing revelers. It was awesome. There was so much to see, from the art to the costumes, but the best part was bumping into friends every few feet. To a person, all said, "THIS is why we love living here! THIS is what Venice is supposed to be like!" Exactly and Amen. The Yellow Submarines were present, with a little chill camp between them. There was live painting going on up and down both sides of the street, with the art fully available for purchase, and inspiration. There were a lot of interactive things going on too, that gave you a good feel of what it must be like at Burning Man (I've never been. I'm cool with that.). There was a keyboard sound studio thing you could make your own beats in. I think my favorite piece (other than the unicorn) was this flat stringed instrument thing that a whole group could play together on at once. It brought unity through music, and friendship through jamming. I loved it. There was a big bird cage people could sit together and chill (and be photographed in). There was a covered wagon with people piled high atop it, perhaps on the way to the Unicorn Stampede at the other end (People in unicorn costumes running). There was a neon corn hole game and a giant Connect Four people were playing. Pretty Sneaky, Sis! There was no police presence at all, that I saw, and that was extra great. No one being hassled for nothing, just people having a great time. There was a complete mingling of the Skid Row West population on Third and Rose, the hipsters that hang on Rose, and friends and neighbors that live for these moments in Venice. Again, totally why we live here. After seeing pretty much everything and everyone (except Alex Rodriguez!) on Rose, there was still a lot of art to see, with Art Crawl venues stretching all the way down to Washington (the end I never seem to make it to, sorry!). After one amazing glance back, we set off to see what else we could see. On the stroll South, we ran into a French couple looking at a map. I asked if they needed help, and they were trying to find the main part of Main Street. I pointed them in the right direction, and told them to take a detour on Rose. They had no idea what they were in for, and I totally wished I'd seen their faces. Hope you had fun, Frenchies! On we went to the slick new men's surf and skate wear shop, General Admission. They were showing the awesome photography of Akira Kobayashi put on by Kana Manglapus featuring Venice back in the day. They were also serving up cocktails, which we enjoyed while spilling out on to Brooks Avenue and chatting with friends. One friend asked of another, "Do you two know each other?" To which they replied, "Probably." It was like that. One lady said, "Doesn't this remind you of how First Fridays used to be?" Which is exactly what I say about Art Crawl every time, and why we love it so much. 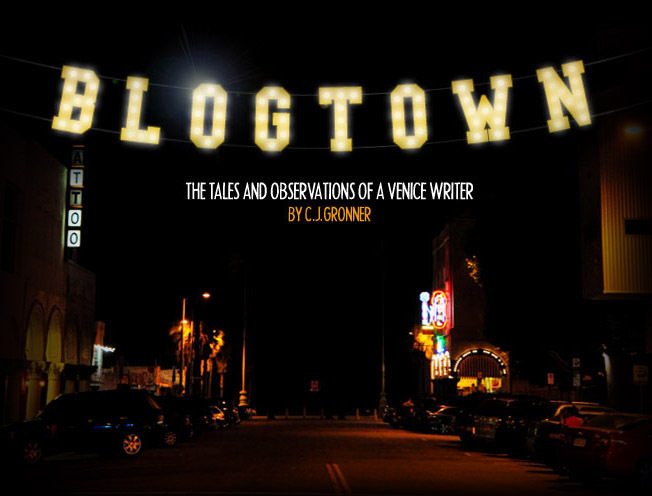 It feels like real Venice, and those that know, know exactly what that means. As nice of a time as we were having with the surf boys, we still had some time to see more. We gave our hugs and directions to the next spot, and headed over to Solé Bicycles to see more surf and skate (our favorite) photography from Brian Averil. It was also super cool, made even cooler by having many of the works printed on Wood. There was a Venice company there, Blocksmith, who takes your photos and prints them on wood for you. I loved it, and you'll be getting a story about them soon. As the clock had not yet struck midnight, we still had some time to squeeze in a little more. Some guys were having a house party on Venice Way, celebrating the release of their magazine, Rank (a Venice-based art and literary publication. This was a great way to end the night, as it was a bunch of locals celebrating in a house (which they were cool enough to open to a slew of strangers, as everyone can do on the Art Crawl. Get your party spot listed for December! ), comparing notes on all that we'd seen. They kindly had drinks and snacks, and even more dancing. As I ambled on home after yet another house party, I couldn't help but smile the whole way home. It was a beautiful night in every way, in one of those rare instances where everyone agrees that it was. www.theblocksmith.comThe feeling that I think people go to Burning Man to try and feel is something that you can find and feel anytime you want, because it's inside of all of our people that we have right here every day. File this one under "I Love You, Venice" for sure. Thank you to all the hard working volunteers that put on this wonderful showcase of Venice with each and every Art Crawl.